Following heels of last year's successful World Wetlands Day celebration, Nepal Tourism Board (NTB) promoted World Wetlands Day 2006 celebration, including Taudaha Jamboree. To undertake actions aimed at raising awareness of wetland values and benefits in general and Ramsar Convention in particular, Friends of the Bagmati in partnership with World Wildlife Fund-Nepal (www.wwfnepal.org), Department of National Park & Wildlife Conservation (www.dnpwc.gov.np), Sustainable Tourism Network (www.welcomenepal.com/stn) and other partners organized various events during this celebration. The cleaning up program at Taudaha Lake on 21st January, initiated by Taudaha Youth Club (TYS), was organized as a pre-event of 2nd Taudaha Jamboree and participated in by the members of implementing partners of various activities during the celebration. 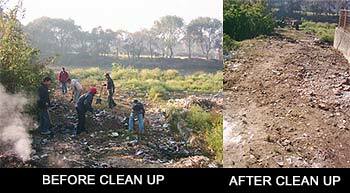 Participants collected rubbish and removed some invasive weeds at the shoreline of Taudaha Pond. During this celebration interactions and features about wetlands of Nepal were broadcast through various FM Radio stations including Radio Sagarmatha 102.4 FM (www.radiosagarmatha.org), co-organizer of celebration events. The main attraction of this celebration was Taudaha Jamboree on 28th January that included activities such as Cycle Rally, Bird Watching, Nature Hike Race, Mithila Art, Exhibitions and Green Map for School Students. Cycle Rally: The day began with a Cycle Rally joined in by more than 50 cyclists wearing T-Shirts with message to conserve ponds of Kathmandu Valley and an implementing partner being Nepal Cycling Club (NCC). The rally inaugurated by Mr. Subash Nirola, Director, NTB started from Dhasharath Stadium, Tripureshwor and ended at Taudaha after covering approximately 10 Kilometers. The cyclists joined other participants of the Jamboree at Taudaha and enjoyed the celebration including fun filled and adventure activities like Bird Watching and Nature Hike Race. Nature Hike Race: The Wildlife Conservation Nepal (WCN) (www.wcn.org.np) conducted the race and organized various activities like Mithila Art, On-the-Spot Art Competition and Green Map for school students. The Hike Race was one of the main attractions of the Jamboree. Hundred and fifty participants raced against each other. The hike was organized on Boson Danda, a hill overlooking Taudaha Pond. On reaching the peak, the hikers were felicitated and their pictures taken against the backdrop of the Taudaha Pond. It was Mr. Dipendra who stood first in the race by completing the hike in 39 minutes. This event was conducted to promote Taudaha vicinity as a good nature hike route in order to preserve the entire area in its natural form. Taudaha is surrounded by forested hills, which could be used as a perfect getaway for a peaceful hike, just within a few minutes drive from Kathmandu city. Mithila Art: On the Spot Mithila Art Workshop was conducted in order to orient the participants about Mithila Art. They were also provided information about this art�s history and significance in our Nepali culture. Participants portrayed Taudaha in different aspects in the canvas. Green Map: WCN also facilitated eight School Students of Kathmandu Valley to make green maps from Balkhu to Taudaha. The map was an interpretation of young students about the state of trails leading to the wetland. Two maps were made on the occasion. The first map pointed out polluted spots, green zones while the second made recommendations to achieve environmental objectives. These maps are student friendly and do play a significant role in identifying the major environmental impacts in the area. On-the-Spot Art Competition: Eight students from the local schools of Taudaha, Bungamati and Khokana participated in the On the Spot Art Competition. The students painted pictures of wetlands on the theme �In The Face Of Poverty� Wetlands Are Lifelines�. Norbu Sherpa of Shree Yuba Prativa HS School of Khokana came first in the event while Anil Tamang and Rajesh Nagarkoti of Shree Yuba Prativa HS School, Khokana and Cardinal International. (Boarding) School of Pharping came second and third respectively. The winners were awarded by DNPWC during a ceremony organized at NTB on 2nd Feb. 2006,World Wetlands Day. Bird Watching: While Bird Watching and Exhibitions were co-organized by Bird Conservation Nepal (www.birdlifenepal.org) and TYC, implementing partners of the Jamboree since its inception. Bird watching program was organized in order to give an opportunity to the participants to become familiar with the birds in and around Taudaha Pond. The professional bird watching experts accompanied the participants. Exhibitions: The photographs, artworks and handicrafts were on display at the exhibition. They were sold so as to raise funds for conservation activities at local level. Few door prizes were offered to the participants of the Jamboree. The Buddha Air P. Ltd., Dwarika�s Hotel, Club Himalaya, The Last Resort P. Ltd., Everest Net P. Ltd. and Mountain Tea Trader sponsored the prizes while Gairidhara Khaja Ghar, Nebico P. Ltd. and United Marketing Inc. sponsored logistics and food. The students, government and non-governmental organization�s representatives, tourism entrepreneurs, tourists, wetland experts, ornithologists, volunteers and general public attended the events. More than four hundred people attended the Jamboree. The workshop was opened by welcome address by Mr. Siba Bhakta Rajbhandary, Vice-President of the Friends of the Bagmati and an inaugural speech by 12 years old Master Dipesh Nepal from Taudaha Area. Following the inaugural speech Mr. Bhairab Risal, senior journalist at the Nepal Forum of Environmental Journalists (NEFEJ) delivered keynote speech while local conservation activists Mr. Purusottham Budhathoki and Mr. Binod Khadka from Taudaha and Nagdaha area respectively shared their success stories regarding conservation of these important ponds of Kathmandu Valley. Mr. Risal stressed on the need to carry development activities in line with proper management of ponds. The workshop was divided into two sessions: 1. Status & Values & 2. Awareness & Conservation. Mr. Bhushan Tuladhar, Executive Director, Environment and Public Health Organization (ENPHO) moderated the first session while Mrs. Renchin Yonjan, Social Architect moderated the awareness and conservation session. In the first session, Dr. Bishnu Bhandari, President, Forum for Ecosystem Management (FEM) made a presentation on �Wetlands and Culture� and Mr. Subash Nirola, Director, Nepal Tourism Board made a presentation on �Tourism Values of Ponds of Kathmandu Valley� while Ms. Ishana Thapa, Program Officer at BCN made a presentation on �Status of Avifauna of Kathmandu Valley�. Stating that nature and culture are blended and complementary to each other, Dr. Bhandari focused on active, well-informed and responsible participation of relevant stakeholders for a successful conservation activity. Mr. Nirola during his presentation stressed on the role of all stakeholders �to start with a Pond (Pokhari) Management Plan of Rani Pokhari, Kamal Pokhari and Nag Pokhari and continue till we all achieve the final goals in making all existing and potential ponds of Kathmandu Valley a potential tourist attraction.� The participants, for including comprehensive information about avifauna of wetlands of Nepal in general and Taudaha in particular, appreciated the presentation made by Ms. Thapa. Presenting on the awareness and conservation session were Mr. B.K. Uprety, Under Secretary, Ministry of Environment, Science and Technology (MoEST) on �Wetlands Conservation and Education,� Mr. Bhupendra Basnet, General secretary, Nepal Forum of Environmental Journalists (NEFEJ) on �Role of Press and Media in Conservation of Ponds� and Mr. Prakash Amatya on �Linkages between Rain Water Harvesting and Conservation of Ponds�. Mr. Uprety stressed on the need to focus on education if we want conservation to last for centuries. Presenting in the same session Mr. Amatya said �Even Melamchi may not be the answer to our water shortage problem, we need to look for cost effective alternatives � and that can be Rain Water Harvesting�. While Mr. Basnet highlighting the role of press and media in conservation of ponds called upon all media people to take their responsibility in this regard. Ms. Neera Shrestha Pradhan from WWF Nepal Program and Mr. Jhamak B. Karki at DNPWC facilitated the overall organization and management of the workshop. Around 190 people from colleges, government and non-governmental organization�s representatives, tourism entrepreneurs, wetland experts, ornithologists, media/press participated in the Workshop. The Roots and Shoots Nepal and Urban Environment Management Society (UEMS) were also the co-organizers of all the events during Wetlands Day celebration. Their support during the program through volunteer mobilization was crucial. We believe this program contributed to the promotion of ponds of Kathmandu Valley in general and Taudaha Lake as a tourism destination in particular. We are very thankful to all those who helped to make this program a great success. 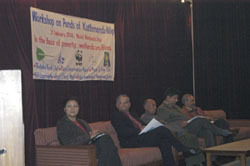 Prior to this workshop, IUCN Nepal, DNPWC and WWF Nepal organized a national program to commemorate the Day. During the program, Chief Guest and Secretary of the Ministry of Forests and Soil Conservation Dr. Swoyambhu Man Amatya launched wetlands poster and a book titled An Inventory and Assessment of Invasive Alien Plant Species of Nepal (IUCN Nepal) and Fact Sheet of High Altitude Wetlands of Nepal (WWF Nepal). Friends of the Bagmati in association with the Clean Energy Nepal (CEN) and the Environment and Public Health Organization (ENPHO) conducted a SODIS (Solar Water Disinfections) Promotion Campaign in the Kathmandu Valley. The main objective of the campaign was to promote the SODIS in 700 households within the Valley. The campaign focuses not only on the promotion but also on the behavioral change regarding the SODIS, a water purification technique through the ultra violet radiation. Friends of the Bagmati introduced, disseminated and promoted SODIS at households of the local community by mobilizing volunteers/promoters. During the project fortnightly supervision and monitoring of households in the community was done. The project was implemented at the following areas of Kathmandu Valley: Handi Gaon, Chabahil, Tilganga, Teku, Balaju, Kalimati and Samakhushi. The total of approximately 1100 households had been given training and around 800 households are implementing SODIS technique to treat their drinking water. 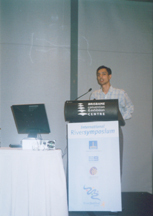 The coordinator of the Friends of the Bagmati, Mr. Rabin Bastola, participated in the 8th International Riversymposium 2005 held in Brisbane, Australia from 6-9 September. He presented a paper titled �Role of Women in Reversing the Degradation of the Bagmati River� at the �Water Benefits - Urban Water Challenges� session. There was a considerable interest shown by the international community towards the sorry plight of the Bagmati River of Kathmandu. Nearly 100 delegates from 38 countries attended the International Riversymposium. The program was successful in disseminating the best river management practices around the world. We would like to thank the Riversymposium organizers and International Riverfoundation for their generous financial support to cover his registration and travel expenses to attend this special program. Please click here for his paper. The Friends of the Bagmati participated in a two-day exhibition organized by Kathmandu Metropolitan City, Clean Energy Nepal and CKV-JICA on 22 and 23 April 2005 on the occasion of Earth Day. Basantapur, Kathmandu was selected as the venue for the exhibition. The overall objective of the exhibition was to increase awareness, educate and promote organizations involved in improving the valley�s environment. Friends of the Bagmati (FoB) and Environment and Public Health Organization (ENPHO) were the two organizations involved in working with water. The exhibition focused on three aspects of environmental activities: Waste Management, Water and Air. 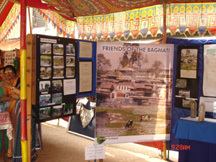 Friends of the Bagmati Stall focused on activities and programs organized by FoB between Earth Day 2004 and 2005. The themes were arranged in a sequence from entry point towards exit as: The Bagmati Today, Friends of the Bagmati � a step towards solutions, The Bagmati, and Solutions for a better tomorrow. Visitors were highly interested to learn about the water quality parameters of the water samples collected from different points of Bagmati River. The interest of visitors was high on the photographic display of problems of Bagmati river and the 4R: Reduce, Reuse, Recycle and Respond messages which can be practiced by any individual in order to reverse the degradation of the Bagmati River. The photographic displays of the activities were very effective in rendering conservation messages to the people. The exhibition raised considerable interest and awareness among general public about the degraded situation of the Bagmati River. More than two dozens individuals and organizations showed interest to work in association with FoB in order to achieve the goal of reversing the degradation of the Bagmati River. Our River ~ Our Life is a Bagmati river conservation awareness program for school students organized by the Friends of the Bagmati (FoB) in association with Clean Energy Nepal (CEN). The water qualities of rivers in Kathmandu have been significantly deteriorated. The water quality of holy Bagmati River truly represents severe degree of pollution in the river system of Kathmandu Valley. Students' participation and mobilization in mass education and awareness campaign holds great significance as desired behavior and attitude change can be easily achieved in the case of children. To aware students regarding the causes, effects and solutions to Bagmati river pollution. To motivate and encourage students to adopt environment friendly attitudes and behaviors to contribute to Bagmati river conservation. To enhance personal capability of students through competition. The focus of this campaign was to involve the students from the schools of the core/downtown area whose sewers finally reach the Bagmati River (Teku � Thapathali stretch). The students competed through poem, painting, photography and news reporting in order to portray the impacts that core city dwellers and the people along the riverbank notice. 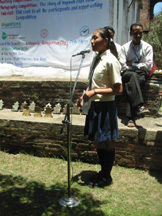 Poem competition: the solution to Bagmati river pollution. 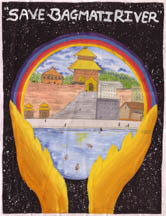 Painting competition: vision for a clean Bagmati river. News Reporting: the issues of Bagmati river pollution. Altogether 80 students from 22 schools participated in different competitions. Besides students guide teachers of the nature clubs, teachers of schools, guardians, volunteers and officials from governmental and non-governmental organizations also participated as an observer. Orientation session of the news reporting and amateur photography competitions was organized on 21st May 2005, Saturday. The total stretch covered was from Thapathali to Teku Kalo Pul. Mr. Sharad Shrestha, senior tour guide explained the importance of cultural heritage found along the Bagmati riverbank. He also provided some tips and points to be remembered while on field visit. During the field visit the participants interviewed local people regarding the causes and effects of the Bagmati river pollution. The participants of the photography competition took photographs of different issues of the Bagmati river system. The field visit ended at Kathmandu Metropolitan City (KMC) office. The participants of the news reporting were provided half an hour time to prepare news report on the basis of the field visit. The closing ceremony was organized at Teen Dewal Mandir, Teku on 28th May 2005. The closing ceremony comprised of exhibition of paintings and photographs of the participants, poem recitation, news presentation and prize distribution. On the same day prizes were distributed to all the winners of different competitions. The brochure containing information about the main reasons of Bagmati River pollution and the messages on how students can contribute to reverse the degradation of the Bagmati River was distributed to all the participating students, and their guardians and teachers. Nitu Maharjan of Padma Kanya School, Bikash Thapa of Mangalodaya School, Preeti Shakya of Bal Namuna Secondary School and Bal Krishna Shrestha of Asphodel Public School were awarded first positions in painting, photography, poem and news reporting competitions respectively. The judges of the competitions were: Govinda Prasad Shah �Ajad� � Painting; Jati Raman Bhattarai � Photography; Gopal Raj Joshi � News Reporting; and Umesh Bhattarai � Poem. School kids distributed token of appreciation to all the judges at the function. Finally, Mr. Bhushan Tuladhar, Executive Director of CEN distributed prizes to the winners. He urged all the participants of the program to be part of the solution to Bagmati river conservation not pollution. He requested all to act immediately in this regard. We believe such programs helps to disseminate conservation messages to the local people in general and the school students in particular. We invite all concerned groups and individuals to support such activities in order to contribute to our effort in conserving the Bagmati River. We expect to work with school students in more elaborate form to address the Bagmati River issues. We are very thankful to Alliance of Religions and Conservation (ARC), United Kingdom; Kathmandu Metropolitan City (KMC); The Nepali Times Magazine; Photo Concern Group; Dwarika�s Hotel and all who helped us to make this program a great success. Success in our terms is � to inform maximum number of people about the ways to perk up the lost gory of the Bagmati River. The Friends of the Bagmati participated in a three-day exhibition organized by the Ministry of Environment, Science and Technology (MEST), His Majesty�s Government of Nepal on 5, 6 and 7 June 2005 on the occasion of World Environment Day at the Academy Hall, Kamaladi, Kathmandu. His Royal Highness Crown Prince Paras Bir Bikram Shah Dev inaugurated the function. While visiting the River Conservation stall he showed interest on the situation of the Bagmati River and inquired about the efforts made so far to address the problem. The overall objective of the exhibition was to increase awareness, educate and promote organizations involved in improving the local as well as global environment. Friends of the Bagmati (FoB) and Nepal River Conservation Trust (NRCT) were the two organizations under river conservation theme. The exhibition focused on various aspects of environmental activities like: Climate Change, River Conservation, Solid Waste Management, Air Quality, Eco-tourism and etc. River Conservation stall focused on activities and programs organized by FoB and NRCT between Environment Day 2004 and 2005. Visitors were highly interested to learn about the water quality parameters of the water samples collected from different points of Bagmati River and the 5th Bagmati River Festival activities. The interest of visitors was high on the photographic display of problems of Bagmati river and the 4R: Reduce, Reuse, Recycle and Respond messages which can be practiced by any individual in order to reverse the degradation of the Bagmati River. 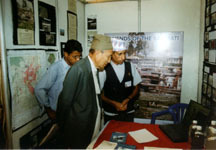 The recent photographs of the Bagmati River photographed by school students on 21st May 2005 were the other attraction of the stall. We believe the exhibition raised considerable interest and awareness among general public about the degraded situation of the Bagmati River. 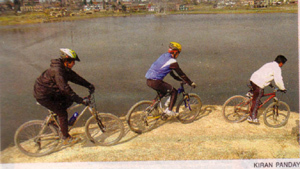 The Nepal Tourism Board (NTB) promoted the event, Taudaha Jamboree 2005; first ever event organized by Friends of the Bagmati and Tuadaha Yuwa Samiti to promote and conserve Taudaha Lake. The Friends of the Bagmati is a registered non-governmental organization established by a group of people from different walks of life who have come together through their common concern and their wish to restore the environment of the Bagmati and other rivers of Nepal. This program aimed at raising public awareness of wetland values and benefits is organized to celebrate the World Wetlands Day 2005. The Taudaha Lake has been chosen because of its cultural and biological significance. Pilgrims throng Taudaha to worship Nag or snake during Naga Panchami (festival of nags/serpents). The rich biological diversity of the lake in general and the habitat of waterfowls in particular have also made this an important wetland resource. Taudaha is one of the small lakes in the Bagmati watershed area. It has also contributed to recharge the groundwater of the Bagmati Watershed. Bagmati, which is the biggest river of the Kathmandu valley, originates from Shivapuri hill, 25 km north of Kathmandu City at an altitude of 2650m above sea level. Taudaha is at approximately 6 km to the southwest of Kathmandu. This is rich in floral and faunal diversity. 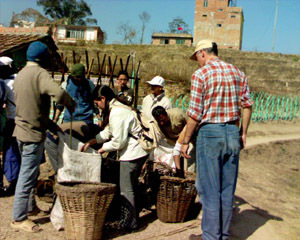 Events of the Taudaha Jamboree 2005: Consultative Workshop, Bird Watching and Cleanup. The Consultative Workshop on Taudaha Conservation was organized on 31 January 2005, as a pre-event of the Taudaha Jamboree 2005, at the NTB Auditorium Hall. Experts and participants at the Workshop stressed on the need to conserve the wetlands that are threatened due to increasing anthropogenic activities. During the function, presentations were made by experts on the various aspects of Religious/Cultural, Tourism and Ecological values of Taudaha Lake. The representatives from Taudaha Yuwa Samiti (TYS) and the Bird Conservation Nepal (BCN) discussed on the efforts made by their organizations to conserve Taudaha Lake. Senior Journalist, Mr. Bhairav Risal from Nepal Forum of Environmental Journalists (NEFEJ) delivered his presentation on the topic: �Role of Press/Media in Wetlands Conservation�. Mr. Risal stressed on the need to give continual emphasis on the promotion of Values and Benefits of Wetlands through the press/media. 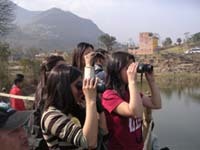 The Bird Watching was one of the components of the Taudaha Jamboree 2005 and was organized on 12th February. Participants included both the Foreigners and Nepalese. Large number of students and locals from Taudaha area also enjoyed bird watching program facilitated by the experts from BCN. The bird watching program was followed by Taudaha cleanup program. The cleanup program initiated by TYS, the local club, was of great success. Participants collected rubbish and removed the invasive weeds at the shoreline of the Lake. More than seven dozens people participated in the program. The Friends of the Bagmati believes such programs initiated by the local people will help to conserve the wetlands resources in a sustainable way. We invite all concerned groups and individuals support such initiative taken by the local denizen. We look forward to work with you in future projects as well in order to conserve Taudaha Lake. Thank you for support and cooperation in making this event a great success. Success in our terms is � to inform maximum number of people about the values and benefits of wetlands. We believe in the concept � Conservation through Promotion! To boost the enthusiasm shown by the local women�s group of the Milan Marg, Teku (KMC-11) to keep their area clean the Friends of theati (FOB) organ rogram in association with them around the Bagmati Ghat (nearby FNCCI office) on 4th December 2004, Saturday. Kathmandu Metropolitan City (KMC) office supported the program by providing necessary equipment and technical human resource. This group of women was trained by FOB under the Neighborhood Watch Scheme project to make the compost manure in order to manage their household solid waste. The participation was quite exciting even at very short notice. Almost 50 people joined hands to sweep up the piles of waste accumulated adjacent to the Milan Park developed by the KMC, Environment Department and along the 50 meters stretch nearby. participated to make the program a success. Participants were of the opinion that the local people should take some actions to make their area clean and they urged the concerned authority to penalize those who dump waste at the public places like this. One of the aged participants from the area demanded that the KMC should provide them the fencing materials and tree saplings and they will make the area habitable. 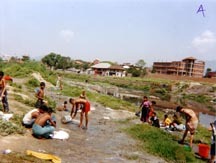 The Friends of the Bagmati believes such programs initiated by the local people will help to maintain the environmental hygiene of the area in the long run. We invite all the stakeholders to support such initiative taken by the local denizen. Thank you for your support and cooperation in making this event a great success.